Your wedding day will probably be one of the smiliest days of your life. You’ll want to make sure your smile shows a set of bright, pearly white teeth during the big day. Luckily there are different ways to help you achieve and maintain a bright smile. 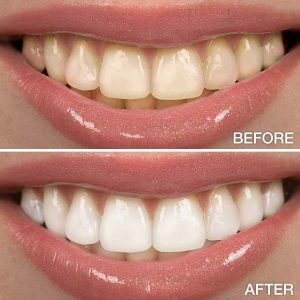 When done with proper professional supervision, teeth whitening is a cost-effective and safe way of giving you a sparkling white smile. Over-the-counter DIY products are much less effective and can cause permanent damage to your teeth and gums. It is also important that your teeth and gums are assessed by a dentist pre-whitening to ensure it is suitable for you. At Westside Dentistry, we offer two teeth whitening options: in-office and take-home. We take impressions (moulds) of your teeth and make custom-fitted trays (these look like very thin mouthguards) that perfectly fit your teeth. The trays are then filled with whitening gel and placed over your teeth. The trays are usually left in for about an hour every night, for about a week. Our dentist will be with you every step of the way, from teaching you how to fill your trays to caring for them so they last for years to come! A protective barrier is placed over your gums to protect them. Cheek retractors will be placed to keep your lips and cheeks out of the way. Then a high concentration whitening gel is applied to your teeth during your session. There will be times when the gel is just left to work and you can use your phone, read a book or just relax whilst you are lying back. While you may be busy planning your wedding, maintaining your dental health is still important. Be sure to brush twice daily with a fluoridated toothpaste for 2-3 minutes. Regular 6-monthly dental check-ups and cleans at the dentist will also keep your teeth and gums healthy, giving you a nice white bright smile for your big day. One of the biggest mistakes made is leaving teeth whitening too late before the wedding date. Ideally, a thorough exam and clean is done at least 6 months before your wedding and a tailored plan created for your teeth to look their best. If you want a whiter, brighter smile and have any questions about which whitening option is best for you, call us on 3278 0580 to arrange a free 10 minute consultation today.